As Chairperson of the Assembly Standing Committee on Agriculture, I respectfully submit to you the 2003 Annual Report. 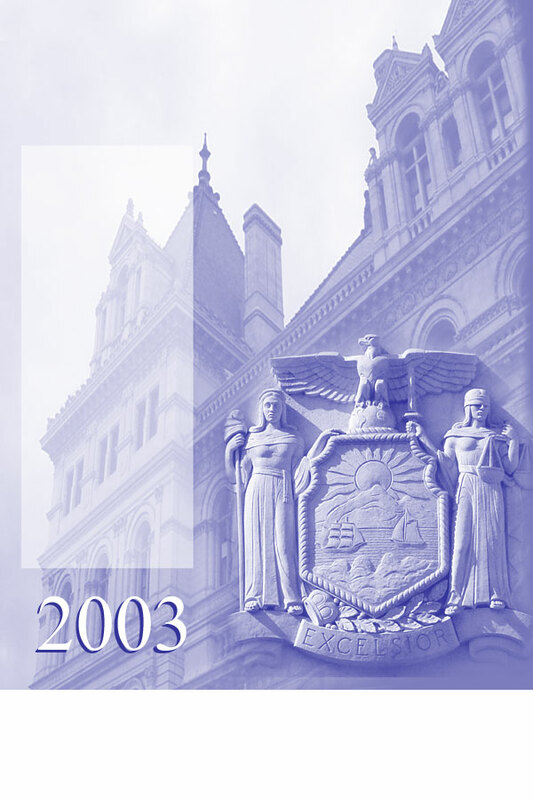 I have outlined the Committee's significant legislation and our outlook for the 2004 Session. The Committee was successful this year in promoting legislation that was crucial in helping family farms remain solvent and profitable by providing funding for critical farm programs and research, reducing regulatory burdens for agriculture, and enhancing the humane treatment of domestic animals. In addition, the Assembly passed legislation that promotes New York State products and provides support for small farm businesses. Dairy products are vitally important to the economy of New York State, representing the vast majority of the State's agricultural industry. New York ranks third in the nation for both milk and cheese production, and is the top producer of these commodities in the Northeast. However, cash receipts - the price farmers receive for milk - have decreased significantly. While milk pricing is primarily established by federal order, the Chairman recognizes the continued need to help producers diversify, find new markets for their products, and ensure that farmers receive payments in a prompt manner. Staffing levels at the Department's Division of Food Safety and Inspection remain a concern to the Assembly Agriculture Committee. The ratio of food inspectors to food establishments in New York State remains dangerously low, with approximately 100 inspectors for over 28,000 stores statewide. The Committee believes that this does not provide adequate protection to consumers from food-borne diseases. As sickness from adulteration, improper observation of storage and other sanitary concerns continue to pose a serious threat to public health, the Agriculture Committee passed legislation to enhance the effectiveness of New York's food safety programs. In addition, the Chairman recognizes the importance of implementing a sound, enforceable kosher statute. Unfortunately, the Senate did not act on any of these measures. New York residents care deeply for the health and safety of their pets. Information gathered during statewide hearings in previous years concerning pet overpopulation continued to inform the Assembly Agriculture Committee's pet agenda for 2003. As the Committee considers possible revisions to the state's Article VII licensing laws governing dog licenses, the Chairman prioritized legislation to strengthen animal rights and encourage responsible pet ownership. Expanding the Definition of "Detection Dogs"
Assembly Agriculture Chairman Bill Magee held a series of regional roundtable discussions to explore approaches to ensure that farming remains economically viable in New York State. These informal meetings focused on how New York can insure the survival of its farms, support local government farming incentives and benefit from the experience of economic development officials, agriculture and farm experts, Cooperative Extension staff, agricultural lending institution personnel, farm attorneys and, most importantly, farmers and producers. With forums held thus far in Niagara, St. Lawrence and Sullivan counties, input was sought to strengthen Chairman Magee's initiative to establish AgriDevelopment Zones in New York State (A.2083). Modeled after the Assembly's successful Empire Zones program, the bill would provide specific relief to farms located within such zones, targeting these areas for extraordinary economic and resource development - assistance that most farmers cannot currently receive from traditional Empire Zones due to eligibility requirements that require applicants to demonstrate a capacity for job creation. The roundtable also sought input on how to make farming more appealing to younger generations. The Agriculture Committee gleaned valuable information from all sectors of the agricultural community on a number of other issues, including the effectiveness of the Department of Agriculture and Market's Pride of New York marketing program, concerns with product distribution and what can be done to help farmers sell products directly to wholesalers and retailers. The continued success of our New York State farmers is vital from both an economic and environmental perspective. Sound farmland preservation policy must remain within the context of the continued profitability and viability of our farms, farmers and the agriculture industry as a whole. Since a healthy agriculture industry means jobs for New York residents, the roundtables revealed that a more comprehensive approach must be developed to ensure the prosperity of our farms in the 21st Century and improve the overall economic health of our rural communities. Further meetings on these topics are expected. Budget Keeps Successful Programs Strong. Other issues facing the Assembly Agriculture Committee include establishing a first time farm-owner loan program, implementing a statewide pricing accuracy law for retail consumers and increasing support for Cornell's Geneva Experiment Station, which is vital to the development of innovative agricultural practices in New York State. A.3550-B Magee	 Authorizes counties to designate an annual 30-day period during which a farmer can submit proposals to include viable land within a certified agricultural district. Also streamlines the procedure for submitting these proposals. Chapter 523 of the Laws of 2003. A.5452 Weisenberg	 Includes dogs used or undergoing training to detect ignitable liquids within the definition of "detection dog" so that this class of professional working dogs and their handlers may also qualify for the exemption of certain fees and unobstructed access to public places. Chapter 287 of the Laws of 2003. A.6454 Magee Provides for the Department of Agriculture and Markets to promote fruit growing and processing and wine and cider production. The Department will use the Hudson Valley Agricultural Center to promote the production of fruits, wine, cider, vegetables, and other agricultural products. Also provides for the licensure of micro-wineries and for the regulation of their business and directs the Department of Economic Development to promote fruit growing and processing and winery businesses. Chapter 522 of the Laws of 2003. A.6455-A Magee	 Includes land of not less than 7 acres used in a single operation for the production of crops or livestock as agricultural land. Allows newly established farms and farmers to receive an agricultural assessment if they meet the required gross sales value during their first year of operation. Chapter 479 of the Laws of 2003. A.6456 Magee	 Includes certain activities involving the use of wind for power generation in agricultural districts as qualifying for agricultural assessments. Currently, only oil and gas exploration, development, or extraction activity is included. Chapter 565 of the Laws of 2003. A.6462 Magee	 Provides for the Department of Agriculture and Markets to enhance fruit growing and to use the Hudson Valley Agricultural Center to promote the production of economically profitable fruits, vegetables, and other agricultural products. Also permits the cultivation of black currants (previously banned) in certain designated areas of the state to promote New York's agricultural industry. Chapter 290 of the Laws of 2003. A.8295 Rules (Magee)	 Relates to the minimum calcium carbonate requirement for wood ash used as an agricultural liming material. This chapter lowers the minimum total neutralizing value to a thirty per centum equivalence in order for a person to sell, offer or expose for sale, barter, give or otherwise supply such wood ash in New York State. Chapter 396 of the Laws of 2003. A.8356-A Rules (A. Cohen)	 Makes technical corrections relating to the scientific names of certain seeds and would amend provisions relating to the labeling of seeds with regard to inspection and sell-by dates. Facilitates the interstate movement of seeds, by conforming certain provisions relating to the inspection and sale of seeds to the model Uniform Seed Law and correcting the taxonomic names of noxious weed seeds. Also revises the procedure for taking seed samples. Chapter 592 of the Laws of 2003. A.8358 Rules (Markey)	 Relates to the New York State Domestic Animal Health Assurance Program, widening the scope of the previous program to include domestic animals other than cattle. The aim of this program is to improve herd health and to further promote a safe and wholesome food supply. Chapter 361 of the Laws of 2003. A.8362 Rules (Magee)	 Conforms provisions of the Agriculture and Markets Law relating to the operation of the milk producers security fund to provisions of the federal Northeast Milk Marketing Order which regulates the marketing of most milk produced in New York State. Chapter 506 of the Laws of 2003. A.8679 Rules (Paulin)	 Protects dogs from health risks and death by requiring appropriate shelter for dogs left outside in inclement weather. Provides standards for compliance and sanctions, including a range of fines, for failure to comply. Chapter 594 of the Laws of 2003. A.380 Englebright	 Would authorize the District Attorney bringing animal abuse charges to petition for the posting of security for the care of the abused animal on behalf of the impounding organization. Would also authorize all such petitions to be filed at or after the arraignment on animal abuse charges. A.398 Lafayette	 Would authorize the Commissioner to inspect and test optical scanning devices and systems. The Agriculture and Markets law would be updated to include laser scanning equipment within the scope of the weights and measures provisions. This equipment scans and registers the price to be charged to consumers for products purchased. An error or malfunction could result in monetary losses to consumers. This legislative proposal seeks to prevent such losses by certifying the accuracy of the laser scanning devices. A.584 Cook	 Would create a nine member advisory board within the Department of Agriculture and Markets on food safety and inspection programs, which would be responsible for advising the Commissioner on the enforcement of food safety laws and regulations. The Board would also review existing and proposed laws and regulations and report to the Legislature on the needed changes. Five members would be appointed by the Governor, including two academic food safety experts, one representative each from the retail and food processing industries, and one farmer. The Speaker of the Assembly and President Pro Tempore of the Senate would each appoint one consumer and one food industry representative. A.1585 Gunther	 Would ensure maximum safety and quality of food products during transportation in the state by allowing inspectors from the Department to examine common carriers transporting food and food products under conditions that could lead to adulteration. Current regulations exempt common carriers from this provision. This bill would ensure that all food and food products are transported under the safest conditions at all times. A.1810 McEneny	 Would provide for the planning and development of regionally based urban greenmarkets that are similar to existing Farmers' Markets. This bill targets the need to provide New York producers with increased market opportunities, and would assist with revitalization in cities and urban areas by bringing the products of farmers and craft businesses into the city, allowing them to sell directly to the customer. A.4169 Klein	 Would require the Department of Agriculture and Markets to inspect every slaughterhouse in the State at least once every year and require each slaughterhouse to post a copy of their inspection. Any slaughterhouse failing three consecutive inspections would be ordered to cease operating until they passed an inspection. A.6546-A Gunther	 Would establish the purposes for which matching grants under the farmland viability program may be awarded. Such grants are awarded for the purpose of preparing or implementing a farmland viability plan to improve farmland profitability and environmental compatibility. Would clarify the definition of an "applicant" and the scope of farmland viability plans. A.8577 Rules (Cahill)	 Would authorize the Commissioner of Agriculture and Markets, upon the request of a municipality, farm owner or operator, to render an opinion to local government officials on land use regulations pertaining to agricultural practices. A.9041 Rules (Silver)	 Would enact the Kosher Law Protection Act of 2003. It is based on the recommendations of a Task Force established by Attorney General Spitzer and Speaker Silver after the federal courts declared New York's existing system for regulating kosher products unconstitutional. Would strengthen consumer protections against false or misleading representations of foods sold or offered for sale as "kosher" by requiring vendors to disclose the basis for their representation that such foods are kosher. A.7308-A Aubertine	 Would exclude any product containing milk protein concentrates, casein or caseinates from the definition of milk. The Governor disapproved the bill on technical grounds, which the Assembly will address in the 2004 session. Veto memo 174. A.8497 Rules (Magee) Would exempt compost (resulting from the natural aerobic decomposition of animal and vegetative constituents) from the definition of commercial fertilizer. Would exempt compost producers from licensure and other provisions and regulations related to the sale of commercial fertilizer in New York State, and would enable compost producers to more effectively market compost. Veto memo 162.